Today’s video covers some important music theory information – when you’re learning a piece, how do you know what key it’s in? There are two types of keys – major and minor keys. We’ll talk about how to find a major key’s doppelganger (minor twin), and how to analyze a piece to determine what key it’s in. Nothing too heavy, just good ol’ fashioned theory fun. So if you have a song in front of you, and it says something like “Bourree in C major”, what this is saying is that the song is written in the KEY of C major. And what that means is that the song is based on C major scale, which if you remember correctly, means it has no sharps or flats. Check out the C major scale video if you want a refresher. Another way this piece will show you it’s based on the key of C major, or C major scale, is the absence of sharps or flats in the key signature (pictured above). Say the piece is called something like “Minuet in G major”, it’s telling us this song is in the KEY of G major, and is based on G major scale. G major scale, if you remember, has one sharp. And if we look above at the key signature, we see one sharp hanging out, and that’s also telling us this song will be in G major. A lot of the time, a piece won’t actually have the key in the name. In that case, you can just head on over to the key signature, and see what that’s telling you. This key signature has one sharp, so we can assume this song is based on G major scale. Except for minor scales and keys! As you might remember from a previous video on major and minor chords, major chords sound happy, and minor chords sound sad. The same is true about major and minor scales, and thus major and minor keys. The best way that I can explain this, is that every major key has a minor doppelganger – an evil twin. So C major scale has an evil minor twin, and G major scale, and every other major scale. So the key of C major has no sharps and flats, right? There’s a minor key lurking out there in the shadows, that also has no sharps and flats, just like C major. Evil twin. You with me so far? G major scale has an F# – there is a minor key out there that also has an F#. There’s a really simple way to find out each key’s evil twin, or minor equivalent if you want to get all technical. Let’s use C major as an example. All I have to do, to get to the starting note of C’s equivalent, is to go down 3 half steps (B – Bb – A). So we land on an A. The key of A minor is the same as C major – no sharps or flats in the key signature – A minor just has a darker sound to it. Let’s do another one. So the key of G major has an F#. To find our doppelganger, we find G, hop down 3 half steps (F# – F – E), and land on E. So the key of E minor has one sharp – F# – just like the key of G major. One more – if you were in the key of A major, you’d hop down 3 half steps, and find that A major’s minor equivalent would be F# minor. Major or minor keys – which one is my song? 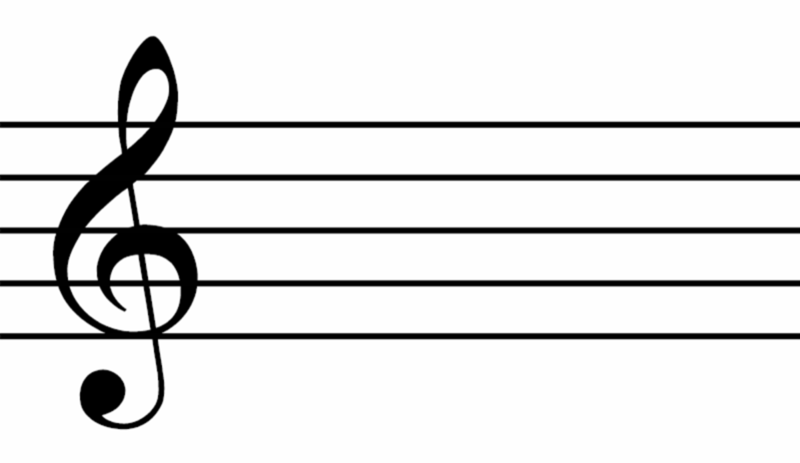 C major and A minor share a key signature – no sharps or flats. So when you see a song with an empty key signature, how do you know what key it’s in? Look at the very beginning, and very end of the piece. The first notes usually reveal everything. If you see right hand or left hand notes on C, or outlining a C major chord, you can safely assume the piece is in C major. If the opening and/or ending notes are outlining an A minor chord, you can assume the piece is in A minor. Being able to tell major and minor keys apart is tremendously useful, as it gives you more information about the piece you’re learning, which in turn, makes it easier to learn. I hope you’ve enjoyed this theory trip!